Dr. P Nandalal Weerasinghe, Senior Deputy Governor, Central Bank of Sri Lanka launching the Roadmap for Sustainable Finance in Sri Lanka at the Sustainable Banking Network Global Meeting of the International Finance Corporation. 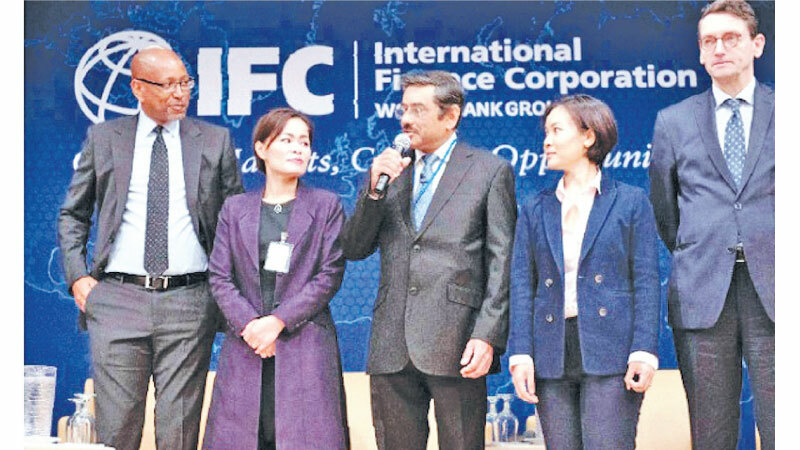 The Central Bank of Sri Lanka launched the Roadmap for Sustainable Finance in Sri Lanka on April 10, 2019 at the Sustainable Banking Network Global Meeting of the International Finance Corporation (IFC) in Washington, D.C, USA. This Roadmap provides a broad direction to financial regulators and financial institutions to effectively manage environmental, social and governance (ESG) risks associated with projects they finance and help increase assistance to businesses that are greener, climate-friendly and socially inclusive. By providing policy guidelines and recommendations for responding to ESG risks and sustainable finance opportunities, the Roadmap attempts to scale up the contribution of the financial sector – including banking and finance, capital markets, and insurance industry – and help building a more resilient, sustainable green economy. IFC, a part of the World Bank Group, served as the secretariat and technical advisor and United Nations Development Programme provided financial support through its Biodiversity Finance Initiative to the Central Bank in designing the Sustainable Finance Roadmap. The Roadmap was developed in consultation with stakeholders including Sri Lanka Bankers’ Association (Guarantee) Ltd, Finance Houses Association of Sri Lanka, Insurance Regulatory Commission of Sri Lanka and Securities and Exchange Commission of Sri Lanka. The Roadmap articulates a series of strategic activities to implement sustainable finance in Sri Lanka, while detailing an action plan to be implemented over short, medium and long term by respective stakeholders. The strategic activities encompassed in the Roadmap revolve around six focus areas namely: Financing VISION 2030, ESG Integration into Financial Market, Financial Inclusion, Capacity Building, International Cooperation and Measurement and Reporting.